The Video review does go through some important features and facts about Episodes of Liberty City and I have focused mainly on The Ballad Of Gay Tony. 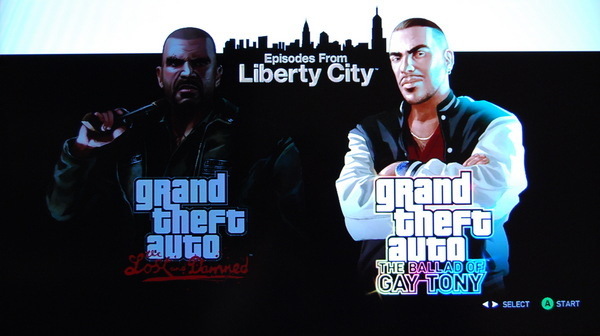 Bear in mind when you do purchase the retail version of Grand Theft Auto : Episodes From Liberty City you get both The Lost and Damned & The Ballad of Gay Tony. I do run through this in detail on the video. Both episodes are also available to also purchase via Xbox Live Marketplace and can be downloaded directly to your Xbox 360 hard drive. This review will not cover anything from The Lost and Damned. I will be discussing and reviewing mainly The Ballad Of Gay Tony. The Ballad of Gay Tony is the second episode in the Grand Theft Auto saga and completes the epic story that Rockstar Games started with Grand Theft Auto IV and Niko. In Ballad of Gay Tony the focus is Liberty City’s nightlife, where everyone and everything is available for a price. This time around you play as Luis Lopez, a personal bodyguard, business partner and good friend to Tony Prince AKA Gay Tony. Tony has been the king of Liberty City Nightlife for the past 10 years. He runs the hottest lounge, Maisonette 9 and one of the most famous Gay Club, Hercules. Now not everything is as it seems. I might be from the outside but on the inside there is some serious money problems. Tony in trouble and that is where Luis(you) step in to sort things out. I will not disclose any story related spoilers in this review. However I will discuss some of the extra features that are available in The Ballad of Gay Tony. As Luis is Gay Tony’s business partner he will be working, managing and sometimes having to get his hands dirty at the clubs. Ensuring that everything is running smoothing is of the utmost importance. such examples of day to day life of Club Management will be ensuring the club is free of any drug dealers, perverts and degenerates. Luis will also have deal with celebrities some tasks are quite enjoyable to do, one such example is helping a closeted rapper avoid getting happy snapped by the paparazzi after a big night over at the Gay club Hercules. There are many more but I’m not going to spoil it for anyone. You’ll have to see for yourself. Discussed in the video review Luis can get up to a fair bit of action and fun at Maisonette 9, he can dance and impress the pretty ladies, and then after impressing them enough he could take his relation with them to the next level, after exchanging cell phone numbers Luis will be able to do what every proud male in the Liberty City takes pride in. And that’s make BOOTY CALLS. Other activities in the lounge include drinking at the bar and my personal favourite the Champagne Drinking game. Making your way up to the VIP area, you can get to challenge someone, chug and spray !! chug and spray !! but don’t throw up or even worse black out like a sissy !! It’s great fun and a nice break from the action. If Base Jumping is a little too stressful then how about hitting a few balls around at the Liberty City driving range. Here Luis can take on his friends or punters. But be warned, it’s not that relaxing, you also have a targets to hit. Like the flag on the pole Waaaaayyyyy way over there. With time, practice and a few screams at the TV you should be able to perfect your swing and get the job done. Of course don’t forget the RANDOM’s (i love the randoms.. don’t you) there will be a few of them hanging around for Luis to help out. If he wants to. I would recommend doing them as most are very satisfying and it’s always great to hear stories and do extra missions along the way. In the video review I explain a little on Multiplayer (Deathmatch) Multiplayer in the Ballad Of Gay Tony is brilliant, action is constant the variety of weapons are fantastic, the deathmatch areas are tighter so more carnage can happen. Death match supports 16 players online, and the objective is to have the most kills with the set time. Players are awarded money for each kill (also included are KILL STREAKS – kill streaks of 3, 5 and 10 gives the player heath and armour bonuses)and the player with the most at the end wins. Team Deathmatch works exactly the same but your now working as a team. The team with most money at the end of the round wins. There are new weapons to pick up and use at your disposal. They are : Assault SMG, Explosive Shotgun, Advanced Sniper Rifle, Sticky Bombs, Pistol .44 and one more which i’ll let you all try and find out for yourselves. The Race and GTA race checkpoint racing multiplayer is also back everything is the same BUT Rockstar games have added one very cool feature that players will absolutely love .. every vehicle now has nitrous !! This should give you that much needed edge, but use it wisely. We don’t want to be scrapping you off any walls or telegraph poles.